The PS3 is an excellent media hub, playing all sorts of video formats, either off the console of streamed from your PC. But one of the things it doesn't handle too well is subtitles support, especially for AVI files. With some other media players, all you need to do is to put the SRT or other subtitle file in the same folder as the video file, usually with the same filename, and the subtitle will automatically be loaded. But this won't work on the PS3. But thanks to a timely firmware release, firmware 2.20 to be precise, you can now add subtitles to your AVI files without having to re-encode your AVI. And these subtitles files aren't hard-coded, meaning they can be turned off in the same way you turn on/off DVD subtitles on the PS3 - and a single AVI file can support multiple subtitles. As SRT files seem to be the most popular, this guide refers mainly to these kinds of files. Best of all, you can do all of this using a single freeware tool called AVIAddXSubs. Before you start adding subtitles to your AVI file, please first make sure the AVI file plays on your PS3. This method only works on AVI files that work natively on the PS3 (that is, if you copied the file over to your PS3, it will play). It does not work on AVI files that only plays through a live transcoder like TVersity (that is, if the AVI file contains a video stream that isn't DivX/XviD and PS3 compatible, then this method won't work). After you add subtitles using AVIAddXSubs, then the file will still be playable in the same way as before (by either copying it straight to the PS3 or played via USB/external HDD, or streamed via TVersity and other streaming tools). Also, I've assumed that you've already got your subtitle file, if not, then you can try our subtitles search engine. AVIAddXSubs supports SRT and idx/sub subtitle files. 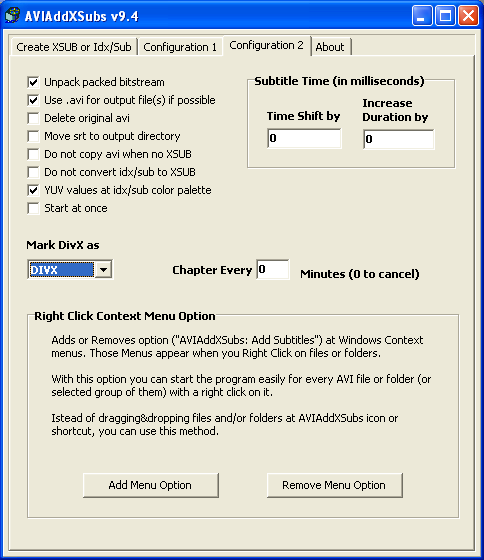 Download the AVIAddXSubs ZIP package. Extract the contents to a new folder (for example, C:\Program Files\AVIAddXSubs\). Click on the AVIAddXSubs.exe executable to start AVIAddXSubs and that's all there is to it, installation wise. We will now configure AVIAddXSubs. Click on the "Configuration 2" tab in AVIAddXSubs. Let's go through each of the options. Use .avi for output file(s) if possible: Without this option, AVIAddXSubs will convert your AVI files to .divx files, which still play on the PS3. On the other hand, and this is what I prefer, I can enable this option so that AVI files are kept as AVI files. The only thing you have to make absolutely sure is that the output folder is different to the input folder, otherwise you run the risk of a failed process. Time Shift By: This adds (or removes) X milliseconds from the start time of the subtitle file, which is really useful if your video and subtitles don't match at the beginning. The number here is in milliseconds, so if you want to delay the showing of the subtitles for 12 seconds, you need to put "12000" in this box. On the other hand, if you want the subtitles to show up 12 seconds earlier, then you type in "-12000"
There's only the context menu options, which you can enable or disable to your own preference. That's the initial configuration complete.